Look! It’s that dish made in Moonstruck/V for Vendetta — egg in a basket. There are certain movies where something is being made or served that have resonated with me to this day. Sometimes randomly during the day, almost always when I cook or eat. Those movies are “Kramer Vs. Kramer,” “Indiana Jones and the Temple of Doom” and “Moonstruck” — all for different reasons. The earliest was “Kramer Vs. Kramer.” I don’t know why my parents dragged me along to see this movie. And to this day, no scene stands out except when Dustin Hoffman’s character attempts to cook his son french toast for breakfast. As a 5-year-old, that scene shocked me down to my little sneakers. It spoke volumes about how Hoffman’s character was coping as a newly single parent and how to care for his son. To this day, every time I have french toast, I think of Hoffman dunking slices of bread in a coffee mug with the name Ted on the cup. On a more light-hearted level is “Indiana Jones and the Temple of Doom.” It’s not that I’ve eaten any of those items served during the infamous dinner scene. Who has, really? But that scene has become sort of a coping mechanism for me when dealing with a meal that seems bizarre or overly weird. I simply draw in my reserve and think that it can’t be as bad as chilled monkey brains. This way of thinking helped me get through my first experience with sushi. In “Moonstruck,” there’s a scene where Olympia Dukakis is going on to Cher about moving out, getting married and whatnot. All that caught my attention were those eggs and how they were being cooked with the bread. Up until recently, I thought it was called “toad in a hole,” but they are actually called “egg in a basket.” Regardless, I make this almost every weekend and the effort to cut a hole from a piece of bread is worth it. The eggs played a role again in 2006’s “V for Vendetta” as V, the masked title character, is cooking up breakfast for Natalie Portman. Upon further research, “egg in a basket” was also referenced by Beach Boys musician Brian Wilson during an interview. The scene comes in about 1:37 in this clip but it’s worth it! Now for some optional reader participation: Are there any movies that have affected your culinary outlook? Which movies are they and how have the affected you? Some frozen prune pudding, perhaps? I think "toad in a hole" is like a puffed pancake with sausage. The ends of the sausage poke out of the pancake to look like a toad in a hole (I'm guessing). I've never actually had it, but I think it would be fun to make. 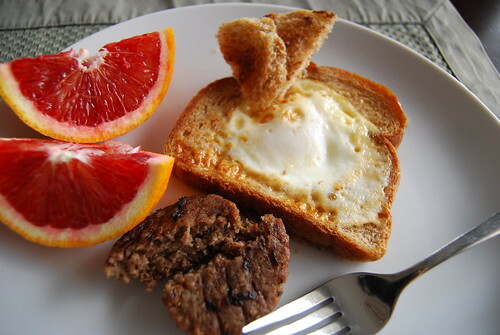 Egg in a basket is awesome, especially if you leave the yolk runny to dip the bread into. it *is* called toad in a hole! at least, where i'm from. alternately, it can be called "birgs in a nest." eggs in a basket just sounds so boring.three cheers for olympia dukakis. Hi Leanne–I agree the a runny yolk is the best for those exact reasons!Hi Us vs Food–I stand corrected and Olympia Dukakis does cook some mean food. Isn't funny how movies can resonate like that, especially when we are young? I love Kramer vs. Kramer, but that does seem like a bizzare choice for a five-year-old. Hi Foodette–I should probably revisit Kramer Vs. Kramer as an adult and get over that french toast scene. Maybe that's why I always choose pancakes instead of french toast.Hi JustJenn–Maybe it is also called toad in a hole too? I'm truly confused what the true name is and wikipedia is no help. I've never seen Kramer vs. Kramer, but that's an amazingly done scene. I'm glad I didn't see it as a child…would've scarred me for life. But then I did see Robocop when I was too young. That probably did some damage. I was never overly fond of eggs, but ever since the first time I saw Cool Hand Luke and the boiled egg eating…*gag*…I just couldn't do it anymore. No more eggs for me. Blech. This post was so funny that it prompted me to write my first comment on MBK. I remember all those scenes (since I watched them with you) and they affected me just as much as you – and I didn't even tell you about them! Sorry just to clarify.. the Martha Stewart recipe is for the 'eggs in a blanket'. And I meant "cheesey" as in "corny". I will put a recipe for Toad in the Hole on my blog. I have the best recipe for it! What an awesome post. I am going to have to think about this a bit…. Oh my gosh. I love the scene from Moonstruck…the snappy Olympia D. but mostly the eggs in bread she was cooking. For so long I wanted to live in that house…with the wallpaper and woodwork and Italian culture! (I've always contented I was switched at birth and my parents are actually Italian). P.S. I ran into Cher on the street one day and she is SHORT! About 5 feet. Who knew? Hi again, London Girl–Thanks for your clarification!Hi Not Martha–Thanks for visiting.Hi Kitchen Trove–I actually had forgotten how snappy Olympia Dukakis was and how cool you ran into Cher! where i come from (so. cal) it's always been called a popeye. My ex-roommate introduced me to this wonderful dish. She told me that her French grandmother made it for her when she was little and had called it "Toad in a Hole." The name scared her off and to get her to eat it, her mother changed the name to "Egg in a Basket." Mio nonno, Pietro, (My grandfather, Peter), used to make these, as well as soft boiled eggs. You should try using a good Italian bread for them! My grandfather's were always hand torn – no cookie cutter! I don't recall them ever being referred to by name, but my very first cookbook called them "Framed eggs".Have you seen No Reservations yet? There's not a certain dish that it brings to mind, but I have the urge to listen to opera and "Mambo Italiano" in the kitchen now!The only food scene I can think of is Goonies…in the Fratellis' place…when Mouth is torturing Mikey by pouring the nasty water from one glass to another. Hi Tere–I've never heard of it being called a popeye. Thanks for the heads up. I'll have to do some research.Hi Girl Can Eat–Don't you just love that scene?? I didn't know it had an impact on so many people!Hi Ghetto Gourmet–Thanks for sharing your roommate's story!Hi Cara Mia–I will try Italian bread next time (I believe that was the bread used in Moonstruck). I have not seen No Reservations yet. And I remember that scene from Goonies!